A deep dive into the mysteries of the Talmud. Skibell (Humanities/Emory Univ. ; My Father’s Guitar and Other Imaginary Things, 2015, etc.) takes a creative approach to the Talmud, a wide-ranging collection of Rabbinic wisdom. “The Talmudic view of life…can be boiled down to six areas of concern,” writes the author: heaven, Earth, ancestors, descendants, others, and self. “A perfect action, a holy action, a righteous action” he concludes, “successfully addresses all six.” These six areas of concern, writes Skibell, are represented as six “memos” to the future reader of the Talmud. 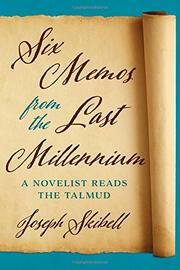 As the author notes in his introduction, “the chapters that follow are an imaginative and personal response to this sacred literature.” In choosing a handful of colorful, almost mythic tales from the Talmud as starting points, Skibell freely journeys from each as a creative writer and, perhaps more importantly, as a student. As an example, he explores the tale of Rabbi Shimon and Rabbi Elazar, who were said to have sought refuge in a cave when fleeing the Roman authorities. After 12 years in the cave praying and studying while being fed miraculously, they returned to the world so horrified by its corruption that their gazes could set objects on fire. Skibell discusses the story in depth and ties it to the ancient Rabbinic debate on whether it is better to have been born or not to have been born. He finds in the tale an existential crisis of the holy trying to exist in a sinful world. Skibell’s work is lucid and erudite, and he does honor to his subject matter. At times, his wanderings take readers far from the starting point, but that is part of the author’s own personal exploration. For readers less acquainted with Talmudic teachings, his work will be a challenge worth the effort. A fresh look at an ancient source.